James McGuinness celebrated his 90th Birthday in stlye at the home of Sean and Dympna McGuinness on 28th July. Instead of gifts James kindly requested donations for local charities PIPS Newry & Mourne and Headway. The response was phenomenal, with each charity receiving a cheque for £1,400. The McGuinness family would like to thank all those who attended the celebrations and gave so generously to the charities. Pips Newry & Mourne would also like to sincerley thank the McGuinness family for choosing our charity and all those who contributed. 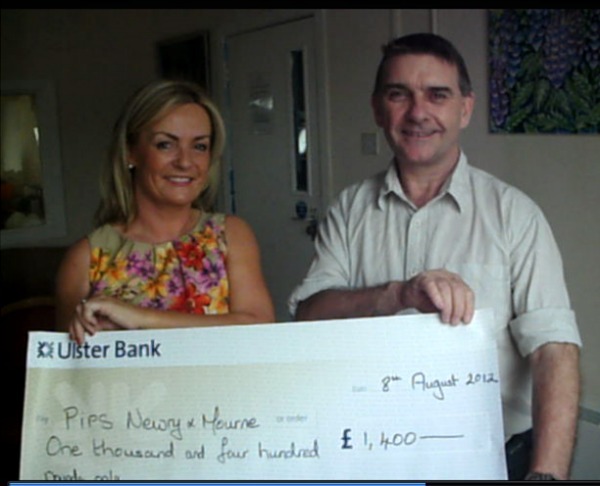 Pictured is Dympna McGuinness presenting the cheque to Seamus McCabe of PIPS Newry & Mourne.